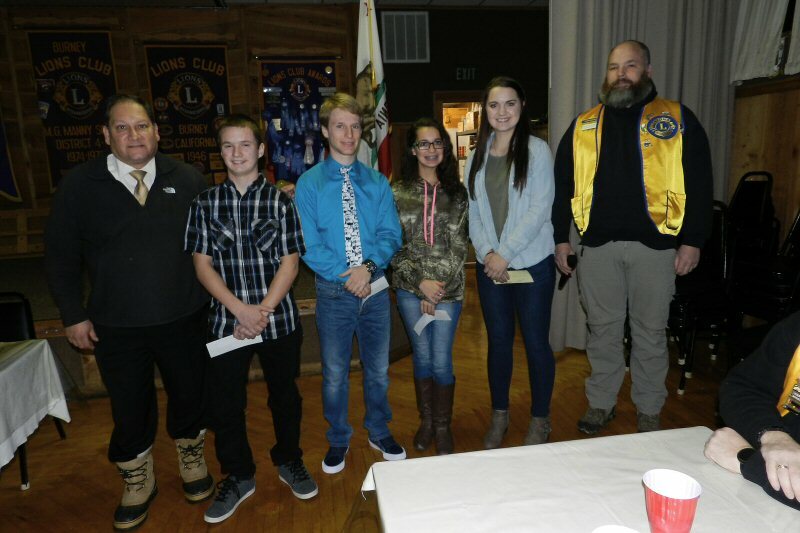 The Burney Lions Club honored four Students of the month at their meeting on January 26. Cole Fruguglietti was recognized as eighth grade Student of the Month for December; Hunter Mustoufi was honored as 12th grade Student of the Month for December; Nykia Gannon was chosen as eighth grade Student of the Month for January; and Maddie Luntey was recognized as 12th Student of the Month for January. Burney High School Principal Ray Guerrero introduced the students and Lions Club President Matt Quinlan presented each student with a check to reward them for their achievement. Eighth grade students of the month each received a check for $50 and 12th grade honorees received $100. Eighth grader Cole Fruguglietti has a 4.0 grade point average. He participates in football and sports. He plays the saxophone in the band. He is a Airman Cadet in the Civil Air Patrol Squadron 126, a volunteer for the Academy of Model Aeronautics Redding Club. and a member of the Workability Program. Cole enjoys video games, remote control airplane racing, remote control cars, flying, sports, camping, shooting and target practice, ocean and fresh water fishing, swimming, boats, computers and movies. Things he has not done yet but would like to do include driving a tank, going to ground school, learning to fly, soloing his own plane, driving a Royal Infield motorcycle, and driving the International. In the future Cole plans to join the Army or the Airforce. He hopes to go to officer school and would like to become a pilot or a tank commander. After completing military service he would like to own his own ocean fishing business. Senior Hunter Mostoufi also has a 4.0 grade point average. He is a member of California Scholarship Federation, Leos, and Leadership Clubs. In sports, he participates in football, basketball, and track. Hunter enjoys hunting, fishing, and the outdoors. He would like to try skydiving. In the future he hopes to attend the University of Nevada Reno to study criminal justice. Nykia Gannon has a 4.0 grade point average. She plays basketball and volleyball and enjoys reading and drawing. She is good in sports, math and art. She would like to do horse show jumping. In the future she hopes to pursue a career as a successful photographer. January’s 12th grade Student of the Month, Maddie Luntey has a 3.8 grade point average. She is a member of California Scholarship Federation, Leos, S-Club, FNL, mentoring, and ASB. She plays on the volleyball, basketball, and softball teams. Maddie enjoys reading good books and would like to go on a trip to Europe. In the future, Maddie would like to go to Shasta College for two years and then attend Chico State and major in Ag Business. Many family members and friends came to the event. After the presentations, several of the parents spoke briefly expressing their pride in the students and their gratitude to the Lions. Afterwards everyone enjoyed a delicious ham dinner prepared by Lions cooks and served by members of the Leos Club.